The material contained in this chapter is based on official government sources as well as information provided by research institutions, policy organizations, peer-reviewed journals and eye witness accounts. The CTBTO remains neutral in any ongoing disputes related to compensation for veterans of the nuclear test programmes. Nuclear weapons have been tested in all environments since 1945: in the atmosphere, underground and underwater. Tests have been carried out onboard barges, on top of towers, suspended from balloons, on the Earth’s surface, more than 600 metres underwater and over 200 metres underground. Nuclear test bombs have also been dropped by aircraft and fired by rockets up to 320 km into the atmosphere. The National Resources Defense Council estimated the total yield of all nuclear tests conducted between 1945 and 1980 at 510 megatons (Mt). Atmospheric tests alone accounted for 428 mt, equivalent to over 29,000 Hiroshima size bombs. 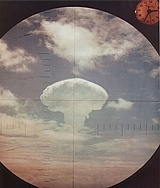 Frigate Bird nuclear test explosion seen through the periscope of the submarine USS Carbonero (SS-337), Johnston Atoll, Central Pacific Ocean, 1962. The first nuclear test was carried out by the United States in July 1945, followed by the Soviet Union in 1949, the United Kingdom in 1952, France in 1960, and China in 1964. The National Resources Defense Council estimated the total yield of all nuclear tests conducted between 1945 and 1980 at 510 megatons (Mt). Atmospheric tests alone accounted for 428 mt, equivalent to over 29,000 Hiroshima size bombs. The amount of radioactivity generated by a nuclear explosion can vary considerably depending upon a number of factors. These include the size of the weapon and the location of the burst. An explosion at ground level may be expected to generate more dust and other radioactive particulate matters than an air burst. The dispersion of radioactive material is also dependent upon weather conditions. Levels of radiocarbon (C14) in the atmosphere 1945 – 2000. Image credit: Hokanomono. The first nuclear test was carried out by the United States in July 1945, followed by the Soviet Union in 1949, the United Kingdom in 1952, France in 1960, and China in 1964. 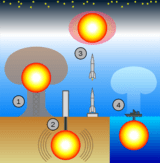 Different types of nuclear tests: (1) atmospheric test; (2) underground test; (3) upper atmospheric test; and (4) underwater test. Prior to 1950, only limited consideration was given to the health impacts of worldwide dispersion of radioactivity from nuclear testing. Public protests in the 1950s and concerns about the radionuclide strontium-90 (see Chart 1) and its effect on mother’s milk and babies’ teeth were instrumental in the conclusion of the Partial Test Ban Treaty (PTBT) in 1963. The PTBT banned nuclear testing in the atmosphere, outer space and under water, but not underground, and was signed by the United States, the Soviet Union and the United Kingdom. However, France and China did not sign and conducted atmospheric tests until 1974 and 1980 respectively. Although underground testing mitigated the problem of radiation doses from short-lived radionuclides such as iodine-131, large amounts of plutonium, iodine-129 and caesium-135 (See Chart 1) were released underground. In addition, exposure occurred beyond the test site if radioactive gases leaked or were vented. Scientist arranging mice for radiation exposure investigations around 1944. (While conducting these experiments, the carcinogenesis of urethane was discovered). Over the past century, there has been a gradual accumulation of knowledge about the hazards of radioactivity. It was recognized early on that exposure to a sufficient radiation dosage could cause injuries to internal organs, as well as to the skin and the eyes. According to the 2000 Report of the United Nations Scientific Committee on the Effects of Atomic Radiation to the UN General Assembly, radiation exposure can damage living cells, killing some and modifying others. The destruction of a sufficient number of cells will inflict noticeable harm on organs which may result in death. If altered cells are not repaired, the resulting modification will be passed on to further cells and may eventually lead to cancer. Modified cells that transmit hereditary information to the offspring of the exposed individual might cause hereditary disorders. Vegetation can also be contaminated when fallout is directly deposited on external surfaces of plants and absorbed through the roots. Furthermore, people can be exposed when they eat meat and milk from animals grazing on contaminated vegetation. Radiation exposure has been associated with most forms of leukaemia, as well as cancer of the thyroid, lung and breast. 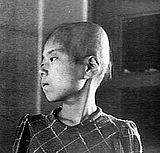 girl who lost her hair after being exposed to radiation from the bomb dropped on Hiroshima on 6 August 1945. The American Cancer Society’s website explains how ionizing radiation, which refers to several types of particles and rays given off by radioactive materials, is one of the few scientifically proven carcinogens in human beings. Radiation exposure has been associated with most forms of leukaemia, as well as cancer of the thyroid, lung and breast. The time that may elapse between radiation exposure and cancer development can be anything between 10 and 40 years. Degrees of exposure regarded as tolerable in the 1950s are now recognized internationally as unsafe. An article featured in Volume 94 of American Scientist onFallout from Nuclear Weapons Tests and Cancer Risksstates that a number of studies of biological samples (including bone, thyroid glands and other tissues) have provided increasing proof that specific radionuclides in fallout are implicated in fallout-related cancers. It is difficult to assess the number of deaths that might be attributed to radiation exposure from nuclear testing. Some studies and evaluations, including an assessment by Arjun Makhijani on the health effects of nuclear weapon complexes, estimate that cancer fatalities due to the global radiation doses from the atmospheric nuclear testing programmes of the five nuclear-weapon States amount to hundreds of thousands. A 1991 study by the International Physicians for the Prevention of Nuclear War (IPPNW)estimated that the radiation and radioactive materials from atmospheric testing taken in by people up until the year 2000 would cause 430,000 cancer deaths, some of which had already occurred by the time the results were published. The study predicted that roughly 2.4 million people could eventually die from cancer as a result of atmospheric testing. (Xe) 6.7 hours Inhalation in excessive concentrations can result in dizziness, nausea, vomiting, loss of consciousness, and death. At low oxygen concentrations, unconsciousness and death may occur in seconds without warning. (241Am) 432 years Moves rapidly through the body after ingestion and is concentrated within the bones for a long period of time. During this storage americium will slowly decay and release radioactive particles and rays. These rays can cause alteration of genetic materials and bone cancer. (131I) 8 days When present in high levels in the environment from radioactive fallout, I-131 can be absorbed through contaminated food. It also accumulates in the thyroid gland, where it can destroy all or part of the thyroid. May cause damage to the thyroid as it decays. Thyroid cancer may occur. (137Cs) 30 years After entering the body, caesium is distributed fairly uniformly through the body, with higher concentration in muscle tissue and lower concentration in bones. Can cause gonadal irradiation and genetic damage. (85Kr) 10.76 years Inhalation in excessive concentrations can result in dizziness, nausea, vomiting, loss of consciousness, and death. (90Sr) 28 years A small amount of strontium 90 is deposited in bones and bone marrow, blood and soft tissues when ingested. Can cause bone cancer, cancer of nearby tissues, and leukaemia. (239Pu) 24,400 years Released when a plutonium weapon is exploded. Ingestion of even a miniscule quantity is a serious health hazard and can cause lung, bone, and liver cancer. The highest doses are to the lungs, the bone marrow, bone surfaces, and liver. (3H) 12 years Easily ingested. Can be inhaled as a gas in the air or absorbed through the skin. Enters soft tissues and organs. Exposure to tritium increases the risk of developing cancer. Beta radiation emitted by tritium can cause lung cancer. 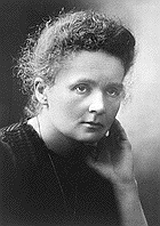 Marie Curie won the Nobel Prize in chemistry in 1911 for her discovery of the elements radium and polonium. The curie unit is named after Marie and Pierre Curie, who conducted pioneering research on radiation. Scientists use different terms when measuring radiation. The terms can either refer to radiation from a radioactive source, the radiation dose absorbed by a person, or the risk that a person will suffer health effects from exposure to radiation. When a person is exposed to radiation, energy is deposited in the body’s tissues. The amount of energy deposited per unit of weight of human tissue is called the absorbed dose. This is measured using the rad or the SI Gy. The rad, which stands for radiation absorbed dose, has largely been replaced by the Gy. One Gy is equal to 100 rad. The curie (symbol Ci) is a unit of radioactivity. It has largely been replaced by the Becquerel, which is the unit of radioactivity. One Becquerel is defined as the number of atoms which decay per second in a sample. The curie unit is named after Marie and Pierre Curie, who conducted pioneering research on radiation. A person’s biological risk (i.e. the risk that a person will suffer health effects from an exposure to radiation) is measured using the conventional unit rem or the SI unit Sv. 20-100 Temporary reduction in number of white blood cells. Mild nausea and vomiting. Loss of appetite. Fatigue, which may last up to four weeks. Greater susceptibility to infection. Greater long-term risk of leukaemia and lymphoma is possible. 100-200 Mild radiation sickness within a few hours: vomiting, diarrhea, fatigue; reduced resistance to infection. Hair loss. In sufficient amounts, I-131 can destroy all or part of the thyroid gland, leading to thyroid abnormalities or cancer. Temporary male sterility. 200-300 Serious radiation sickness effects as in 100-200 rem. Body cells that divide rapidly can also be destroyed. These include blood cells, gastrointestinal tract cells, reproductive cells, and hair cells. DNA of surviving cells is also damaged. 300-400 Serious radiation sickness. Bone marrow and intestine destruction. Haemorraging of the mouth. 400-1000 Acute illness, possible heart failure. Bone marrow almost completely destroyed. Permanent female sterility probable. 1000-5000 Acute illness, nerve cells and small blood vessels are destroyed. Death can occur in days.